Holding the record for both the most victories and the only institution to three-peat in the SGU Knowledge Bowl competition, the pressure to win was on for Presentation Brothers College (PBC). However, finals newcomer Hillsborough Secondary School (HSS) dominated this season, defeating the 5-time champion and earning their first-ever win. The final match held at SGU’s Charter Hall on 14 April, seemed like a battle between David and Goliath as the winningest team in the secondary school competition, PBC, was the crowd favorite to win. Nevertheless, it was the underdog HSS, who had not lost a single match throughout the entire season that came out on top. With only a handful of supporters in the audience but hundreds more cheering them on from Grenada’s sister island, Carriacou, HSS continued its dominance, remaining undefeated in Season 13. 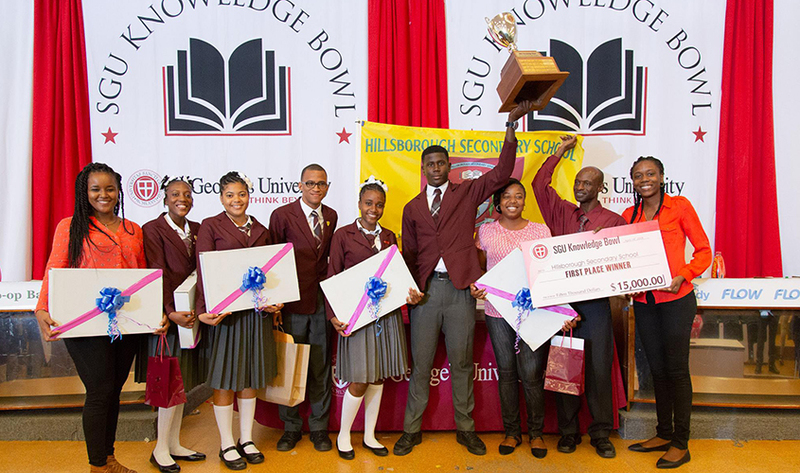 For its school, the HSS team was presented with the coveted Knowledge Bowl Challenge trophy and awarded $15,000 from St. George’s University. Additionally, each of the five team members — Lené Mitchell, Roshaun Lendore, Anthony Matherson, Teja Patrice, and Cristel Belmar — received a laptop and six months complimentary broadband service from FLOW, along with $500 in a Super Starter Investment Plan from Grenada Co-operative Bank, a certificate of distinction and a supply of Ribena from Geo F Huggins. Their coaches were awarded a laptop and six months complimentary broadband service from FLOW, $500 in a Super Starter Investment Plan from Grenada Co-operative Bank and each received a 2-night stay for 2 at Spice Isle Beach Resort or Maca Bana Resort.